Nintendo Super Famicom Cart. published 26 years ago by ASCII Ent. Soft., Inc.
Wing Commander © 1993 ASCII Ent. Software, Incorporated. Wing Commander is the Super Famicom conversion of the space combat simulator originally released for PC Computers. The game is set in the year 2654 where humans are engaged in a war against the Kilrathi, a race of hostile lion-like aliens. The player takes control of a young rookie pilot from the Terran Confederation and, on board the TCS Tiger's Claw space carrier, guides him through many different missions and objectives. Different types of missions are available, from patrols (engage waves of enemy fighters) to escorts (guard spacecrafts) and strikes (direct attack on enemy's battle ships). The game begins in the Tiger's Claw lounge where the player can talk to other crew members or practice at the nearby flying simulator. Soon, he receives his first briefing and is thrown into action, flying his first space fighter - the light Hornet. Space combats are played from a first person perspective from inside of the cockpit, and use all the Super Famicom's sprite scaling and rotating effects. The player can use his main laser-cannons (which have to be quickly recharged when used) or a limited amount of missiles. His onboard computer can point him to his next target or let him to fly back to the Tiger's Claw when necessary. However, in case of extensive damage, the player may need to eject and lose the space fighter. 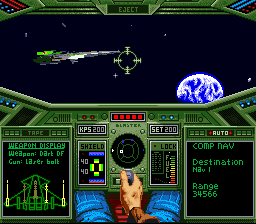 Wing Commander has numerous space fighters to choose from, each with its own characteristics and set of weapons. The game features an unusual difficulty level where the better the player is, the easier and quicker he completes the game. Because of this, Wing Commander has multiple winning and losing routes throughout the game. Wing Commander was first released for PC Computers in 1990 by Origin Systems and was designed by Chris Roberts.